By going through the following construction video, you can learn the tips for obtaining formula toward full superelevation of highway or road. This video is very useful for land surveying. Full super-elevation stands for the amount with which the external edge of a curve located at a road or railway is grounded directly above the inner edge. Its units range from meter/meter or feet/feet. 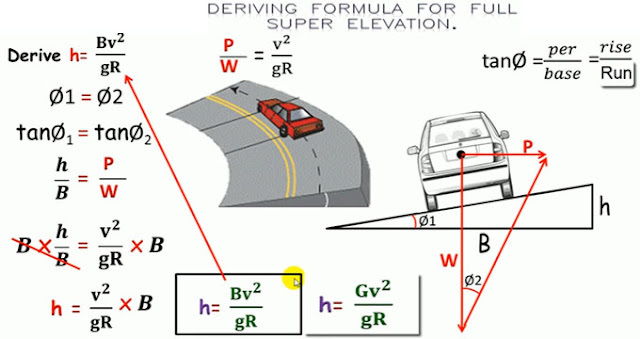 Another definition of super-elevation is the vertical distance among the heights of inward and external edges of highway pavement or railroad rails. In order to neutralize the consequence of centrifugal force as well as decrease the trend of a vehicle to overturn and to slide laterally outsides, pavement outer edge is elevated in regard to the inner edge. Consequently, delivering a transverse slope is called Superelevation. Here B denotes breath of the road, v stands for speed of vehicle, g stands for acceleration (that is 9.8 m/s2) and R stands for radius of circular curve. To know the detailed process, go through the watching video.